Synonyms: ReZero Dainishou: Yashiki no Isshuukan-hen, Re: Life in a Different World from Zero: The Tale of "1 Week"
High school student Natsuki Subaru has been summoned to a fantasy world while on the way home from a convenience store! Based on his knowledge of stories where people get transported to other worlds, he assumed he must have some kind of super power, but that assumption ended up getting him beaten and nearly killed during a mugging. He is rescued by a half-elf, Satela, and her companion, a small magical cat called Puck. They're looking for something that was stolen from them, and Subaru decides to help. However, all too soon, he learns that he does indeed have a special ability. When he dies, he begins his adventure again from the moment when he was summoned to the fantasy world. Will he be able to use his ability to help Satela? 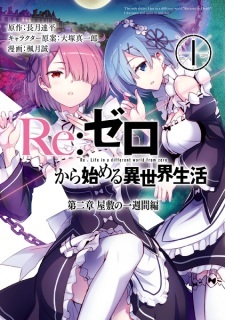 Re:Zero kara Hajimeru Isekai Seikatsu: Dai-2 Shou - Yashiki no Isshuukan-hen has been published in English as Re:ZERO -Starting Life in Another World-, Chapter 2: A Week at the Mansion by Yen Press since May 23, 2017. It has been also licensed in Polish by Waneko.